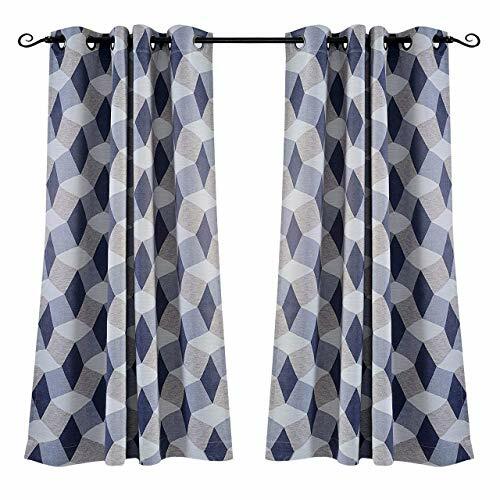 Mysky Geometric Print Curtain Panels offer you a modern look and style. these print curtains will easily add an elegant of sophistication when you hang them. Their variety of colors make them versatile enough for every room in the home or office. The colors enrich decorating styles to your home, yet creates a feeling of innovation in all settings, providing luxury fashion style for your home, business and family. We offer these curtains in 4 colors featuring 8 grommet constructions on each curtain to create a rich pleated design. These Geometric Print blackout curtain is perfect for: Late sleepers, Shift workers, children, seniors, Infants, parents, Students, Computer operators. Best to hang in your living rooms, nursery room, bedrooms, kitchens, sliding glass doors and even offices. If you have any questions about this product by MYSKY HOME, contact us by completing and submitting the form below. If you are looking for a specif part number, please include it with your message.